When it’s time to get your father a gift, it’s pointless asking him what he would want since he will probably tell you he does not need anything. Nonetheless, you are not going to let father’s day, Christmas or his birthday pass by without recognizing him and his efforts at raising you. If your dad is a DIY enthusiast he will definitely love a new, cool tool which he will add to his collection. To make your shopping easier we have listed down a couple of gifts for dads that will certainly suit his tastes. If you are in the market searching for a new power tool to gift your dad you might have come across the reciprocating saw and the jigsaw. When choosing between a jigsaw vs reciprocating saw you should remember that their main difference can be simply traced back to their creation and destructive capabilities. The jigsaw has fine blades that are used for refinement and creation. On the other hand, the reciprocating saw is designed to destroy and rip things apart. Also, the jigsaw is lighter compared to the reciprocating saw, this maximizes the amount of creativity you can achieve while using it since you are able to move more freely. Alternatively, the reciprocating saw is considerably heavier, rougher and much longer. This makes it ideal for destroying rough and heavy materials. Your dad will definitely appreciate if you got him one of these. Cords on a router are often a bother, and they always have a way of getting snagged on your instruments. Going for only $130 this powerful 18 volts cordless router by Makita provides the same power and advantages of a corded router. It also entails an on and off switch that helps stop accidental startups and it also has an electronic speed control that is smooth and effective. YETI is widely known for having tough nail coolers, YETI designers have gone back to the drawing board and upgraded the popular 5-gallon bucket beyond anyone’s expectations. Your father will love and appreciate it’s functionality on the dock, in the garage and everywhere else he requires a reliable hauler. It’s manufactured from high-quality polyethylene making it strong enough for demolition cleanups and campsite kindling. What’s more, it is also food safe enabling your dad to carry his latest catch from the river. This tool is available for only $40. It seems like the current trend is going cordless. Rigid is taking the lead in this new revolution by introducing the 18 volts 1-gallon air compressor which is power-driven by one or two batteries. It has the capability of driving a maximum of 1200 brad nails after each charge. This is more than enough for your father to install baseboards or build a table. Its current going price is $180. Pelican is known for its outstanding soft coolers, and it has just expanded its lineup with their largest cooler to date. The elite soft cooler has a capacity of 48, this is more than enough space for your dad to carry all the hydrating essentials needed by him and his buddies on their tailgating excursions or camping trips. It is 55% lighter than other similar sized coolers and it incorporates a leak-proof zipper which ensures heat doesn’t get in and the cold doesn’t get out. These terrific coolers are priced at $340. 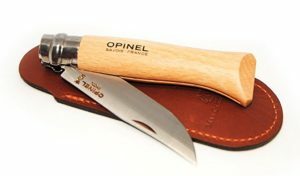 Every man needs a stylish, utilitarian pocket knife and there currently exists no better gift option than the classic and trustworthy Opinel pocket knife. These pocket knives are cheap, simple, and sharp, and they come in a wide range of designs, woods, and sides. If your dad is looking for a pocket-sized knife the Number 6 would be ideal and if he wants a perfect workbench or desk knife the larger number 8 would suit him best. It’s currently sold at $11 only. Tailgaters will particularly love and take notice of the brand new Power Box 360 by Bosh. It is built robustly and offers every music connectivity selection that is currently available. Regardless of whether your dad is at a game, his garage, shop or job site this powerful device will literally bring music to his ears. It could also power some of his tools, however, it has to be tools that are powered up to a maximum of 10 amperes. This outstanding device is available at a price of $180. There you have it, we have highlighted some of the best tools that are available currently. It’s now up to you to make a decision on what to get for your dad on that special day. All the same, you should remember it’s the thought that counts.